Search Results for "womens march"
Women's March walking through Amsterdam, protesters carrying big sign reading 'Women's March'. GRANT PARK, CHICAGO-January 20, 2017. Women's March in Chicago. Mayor Rahm Emanuel greets a family with children at the march. Cutaway of marching feet at the 2017 Women's March on Washington in Washington DC. CHICAGO, IL-January 21, 2017. Chicago Women's March. Supporters marching down Michigan Avenue and chanting. A woman is dressed as the Statue of Liberty. 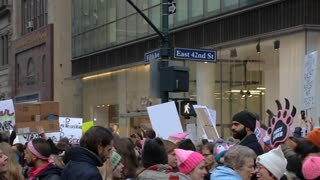 Protestors march against President Donald Trump at the Women's March in Washington DC. Zoom Women's March on Washington, marchers pass with signs, part of gigantic turnout that flooded DC in an anti-inauguration show of solidarity. Park Police cars, sirens, pass by Women's March on Washington marchers. In spite of record-breaking size of demonstration against Trump, there were no arrests. Protestors march and argue against President Donald Trump at the Women's March in Washington DC. Demonstrators from Women's March, Jan. 20, 2018 arrive at White House after marching from Lincoln Memorial rally. Interesting placards abound. Feet marching on the street at the Women's March on Washington in 2017. This is What Democracy Looks Like chanting as Women's March on Washington marchers head towards Executive Office Building, part of gigantic turnout that flooded DC in an anti-inauguration show of solidarity. Washington Monument in distance, Women's March on Washington marchers pass with signs, part of gigantic turnout that flooded DC in an anti-inauguration show of solidarity. We Go High, They Go Low, chant, high angle Women's March on Washington marchers roving the streets in anti-inaugural spirit. Turning corner downtown, Women's March on Washington, crowd passes with banners, part of gigantic turnout that flooded DC in an anti-inauguration show of solidarity.